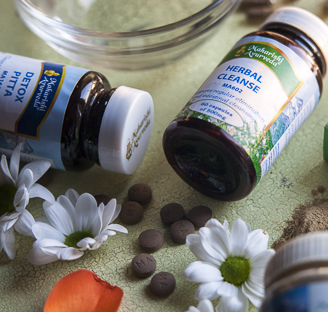 In our Maharishi AyurVeda beauty formulas, certain rare herbs work together synergistically to help detoxify the liver and blood. Other herbs support your body's ability to absorb food nutrients and thereby help improve the entire skin-building process. 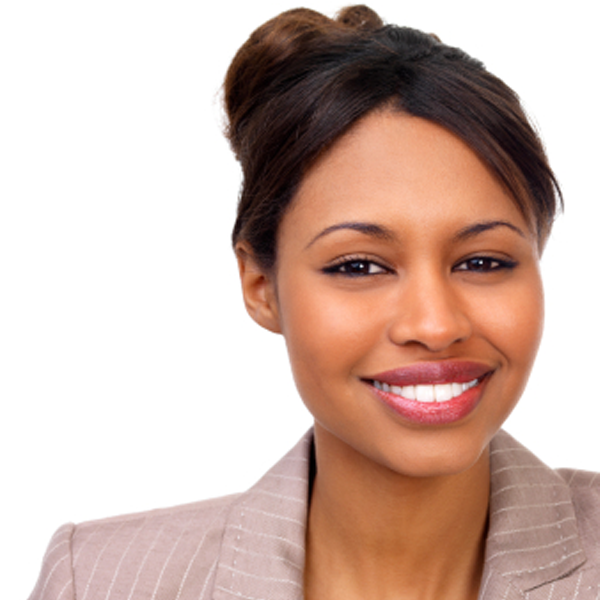 The ordinary approach to skin care is moisturizers and wrinkle creams. it is more important to nourish your skin cells from within. 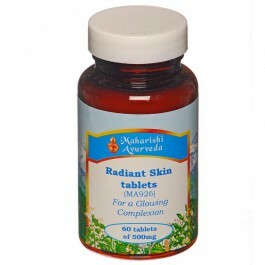 Radiant Skin tablets are a precise blend of 14 rare herbs that help purify the liver and blood, and support your body's ability to absorb nutrients. This helps improve the entire skin-building process. 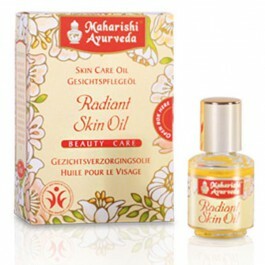 Radiant Skin includes concentrated, cold-pressed herbal extracts that maintain the value and power of the whole plant. less internal toxins (Amavisha) due to improper digestion (Ama) that can accumulate in the skin. Tinospora is said to be the only herb that helps eliminate both Amavisha (internal impurities due to improper digestion or metabolism) and Garavisha (external toxins from environmental pollution and preservatives, colouring or other chemical additives in our food). It also has excellent properties as an immuno-modulator. Red Sanders balances Pitta in the skin (sensitivity) and help keep the skin clear. Neem is also a detoxifier, cleansing the body of toxins. Minimise intake of oily foods and citrus fruit. Taking fresh sweet fruits is useful. 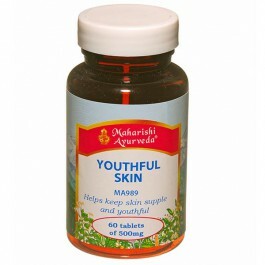 In Ayurveda it is more important to nourish your skin from within. Radiant Skin tablets are a precise blend of 14 rare herbs that work synergistically to help detoxify the liver and blood. It also supports your body's ability to absorb nutrients from food and thereby helps improve the entire skin-building process. Radiant Skin includes concentrated, cold-pressed herbal extracts that maintain the value and power of the whole plant and helps you regain a glowing complexion. 60 tablets (30g) 30-10 days supply. For the first 15 days take 1 tablet with water twice daily after meals. Then increase to 1-2 tablets 3 times daily. Do not take in conjunction with Be Trim 1 (MA4006) and Be Trim 2 (MA1007),and Detox (MA1010).